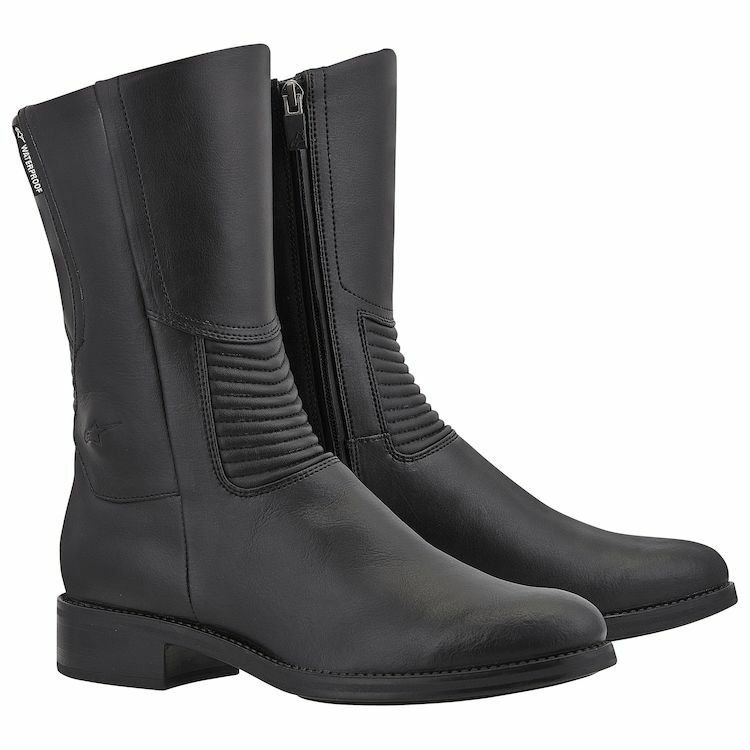 Sleek and modern yet undeniably classic in appearance, the Alpinestars Stella Vika Boots are ready for anything. The soft waterproof leather and suede construction is backed with a 100% breathable membrane to keep your feet completely dry. Advanced polymer protection is set underneath the leather to boost impact protection and strengthen the overall design of the boot. We chose this item because of its feminine looks and protective features. Fit my girlfriends style and it had good reviews. They are ALPINESTARS! Very stylish and safety for my body. looked more like regular boots. I liked the protection factor and ankle support, just in case. What is the calf circumference of these boots, both stretched and un-stretched? For those who have ridden in these between 30-50 degrees, were they warm enough? BEST ANSWER: I have ridden when the weather was in the low 40’s - for about an hour - and my feet were not cold. Hope this helps! What is the height of this boot? I have a thick calf and want to know where the top of the boot will hit me. BEST ANSWER: Boot is 10.5 (floor to top). Hits wife right under the meaty part of calf. She is former ballet dancer and has well defined calves. I'm 7.5 on nine west and on steve maden witch do you recomend the 39 or the 38? BEST ANSWER: I am a US 7.25 (depending on the brand I am a 7 or a 7.5, more likely 7 with open toes and 7.5 with closed toes. I purchased the 38 and they fit great - not tight, not loose. They are leather so they will adjust slightly to your feet. I hope this helps you! I’m an 8.5 and got the 39. They fit perfectly. Also- these boots are stellar. I wear them everyday still and I’ve had them for a little over a year and a half! I wear a size 10 on my Doc Marten's, but usually I wear 9. Which size should I get? I might have missed it in the description, but does this boot have a shin guard of sorts? I currently have the Sidi Fusion Lei boots. How do you feel the protection compares? I'm approximately the same size as your model in the other vika lines. I also have along inseam and I'm worried the vika pants will be too short. Will this boot not work or look silly worn over the pants as opposed to under the pants? BEST ANSWER: Well, I don't think I would wear this boot on the outside of jeans, but I only wear tall boots for outside of jeans. I can see wearing a shorter boot on the outside, but this one is taller than an ankle boot and not tall enough to be traditional boots. You could probably get away with it if your jeans are similar to those "leggings" style that Levi's has putting out the last couple seasons. Anthony sometimes gives a stiffness rating. What is the rating for this boot? Love the lack of logos, built-in protection, and simple design. BEST ANSWER: While there's not an actual men's version of the Alpinestars Women's Vika WP Boots, the following options will be similar in regards to minimal branding/logos.